How have activists anticipated, reacted to, and portrayed the threat of fascism in the U.S. public sphere, from McCarthyism and homophobic evangelism? 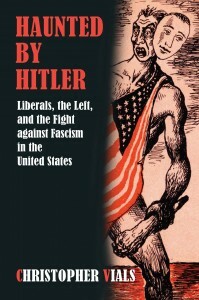 Although less a history than a series of episodic essays about aspects of a history, Haunted by Hitler, a new book by Christopher Vials, contains valuable information, speculation, and analysis about how activists have anticipated, reacted to, and portrayed the threat of fascism in the U.S. public sphere. Starting with the birth of fascism in Europe, the book is organized more or less chronologically into seven chapters, the most interesting of which are two that focus on McCarthyism and the gay rights movement, respectively. An American incarnation of fascism may well have an evangelical Christian face. An anti-fascist movement is as necessary now as it has ever been. Victor Navasky teaches in Columbia University’s Graduate School of Journalism. Among other books, he is the author of Naming Names, which won the National Book Award, and is the former editor and publisher of The Nation magazine as well as the chairman of the Columbia Journalism Review.